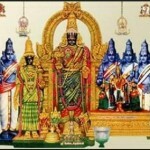 There are 108 Divya Desams – temples/abodes of Lord Narayana that have been sung by the Azhwars. This month, take the quiz to learn more about one of the ancient temples built during 8th century, Sri Parthasarathy temple in Triplicane Chennai. 1. In which city in Tamil Nadu is Parthasarathy temple located? 2. Name the avatar of Lord Vishnu to whom this temple is primarily dedicated. 3. Parthasarathy temple is located in a place called Triplicane, which was previously known as ‘Thiru-Alli-Keni’. What does the term ‘Thiru-Alli-Keni’ mean? 4. What does the term ‘Parthasarathy’ refer to? 9. The presiding deity, Parthasarathy has a _______ on his face. 11. Name the Azhwars who have sung praises (Mangalasasanam) on the deities of the Parthasarathy temple?